Apple's iPhone 5s is equipped with both an A7 processor and a new "M7" chip that is otherwise known as a "motion coprocessor." It is designed to work alongside the A7 processor, capturing motion data from the phone's compass, accelerometer, and gyroscope to power a new generation of health and fitness apps. Alongside the M7 chip, Apple has also introduced new CoreMotion APIs that can take advantage of the M7 coprocessor to create improved fitness and activity apps that are unavailable on similar devices. 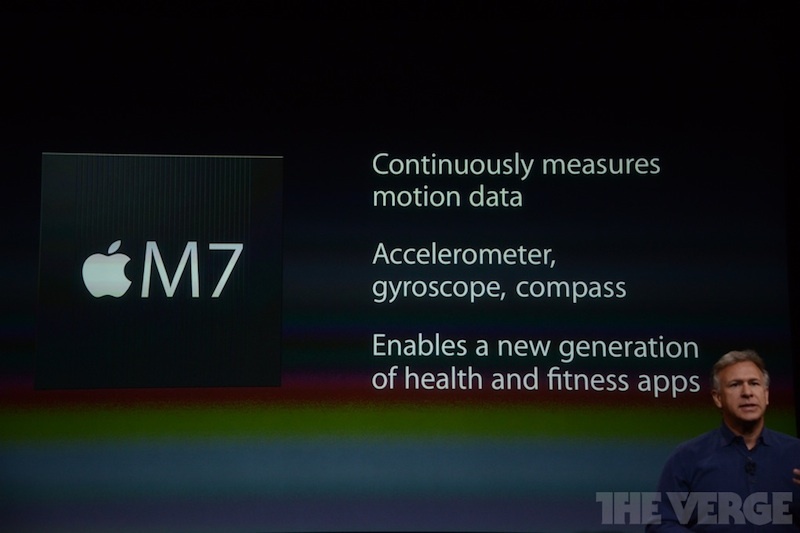 The M7 coprocessor is able to measure and track all movement data, even when the phone is asleep, and because it's a secondary processor, it saves battery life while allowing pedometer-style apps to run in the background. Nike has introduced the first new app that will take advantage of the technology. Nike+ Move is able to determine when a user is walking, driving, or stationary, and it works with the Nike Fuel movement ratings, integrating them into Game Center. The iPhone 5s, which includes the M7 chip, will be available for purchase beginning on September 20. The phone will be priced at $199 for the 16GB version, with a 2-year contract. Have a feeling we'll be hearing this again when the 'iWatch' is released. So apple is now taking design cues from Samsung.. Better camera...already good enough for a phone. Faster processor...how fast foes it need to be, really? I think Apple's jumped the prover ial shark with this one. They can't even control the leaks at all. You realize your complains aren't Apple specific right? The smartphone industry has matured. At this point, all updates/upgrades are incremental. My GS4 already has all of this. The smartphone that came after the iPhone 5? Your point? As a longtime Apple fan, I'm sorry to say this was a very unimpressive keynote. At a minimum, I expected an affordable off-contract phone as anticipated but obviously the carriers have their claws deeply into Apple's hide and they weren't going to allow that to happen. 1) touch ID will be awesome. ill use it 100 times a day. 2) camera can never been good enough. cell phones naturally trail behind dedicated point & shoots, but always room for improvement. 4) jumping the shark is doing something ridiculously stupid and tacky. that has not happened here. Your B key is broken, yo. Who cares about NFC? **** NFC, it's a security concern, and bluetooth is just as good, and has more uses. Then you obviously are ignorant regarding NFC (especially being extremely secure, research RFID, that so-called "safe" tech included in many major credit cards as "Blink"). Many countries and individuals make use of it daily, from purchasing to controlling devices. Research a little, you would realize you are extremely incorrect. No, it's just too close to the space ar.